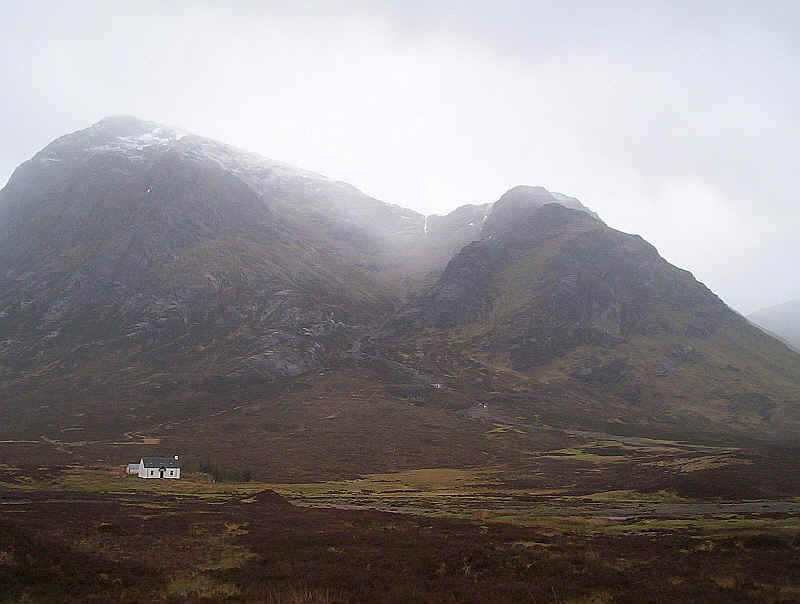 I've wanted to climb Buachaille Etive Mor ever since I saw it for the first time when walking the West Highland Way. 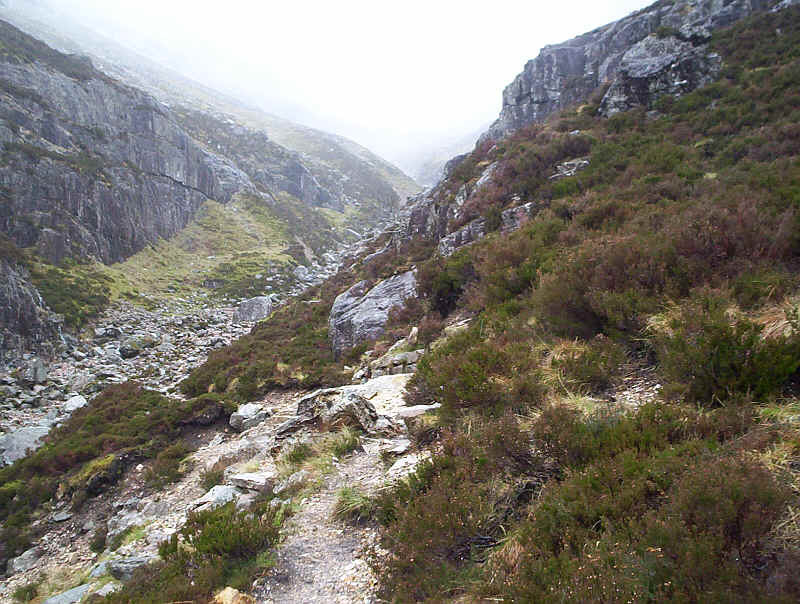 Its sheer sided cliffs make it look impossible for the ordinary walker but, of course, there are ways up. 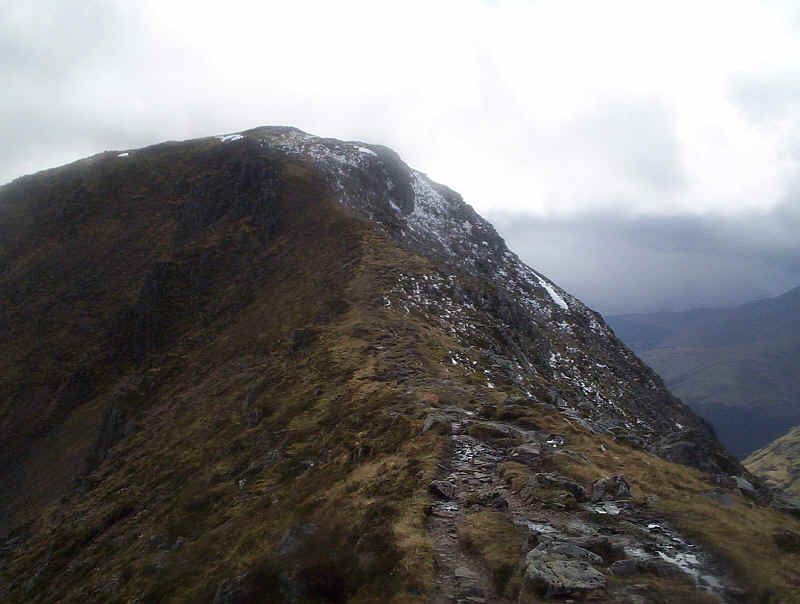 I'd planned to climb the hill on three occasions before I succeeded in May 2009. The first time a road accident had closed the A82 whilst on the second occasion the cloud base was down almost to the valley floor and there seemed little point in attempting it. 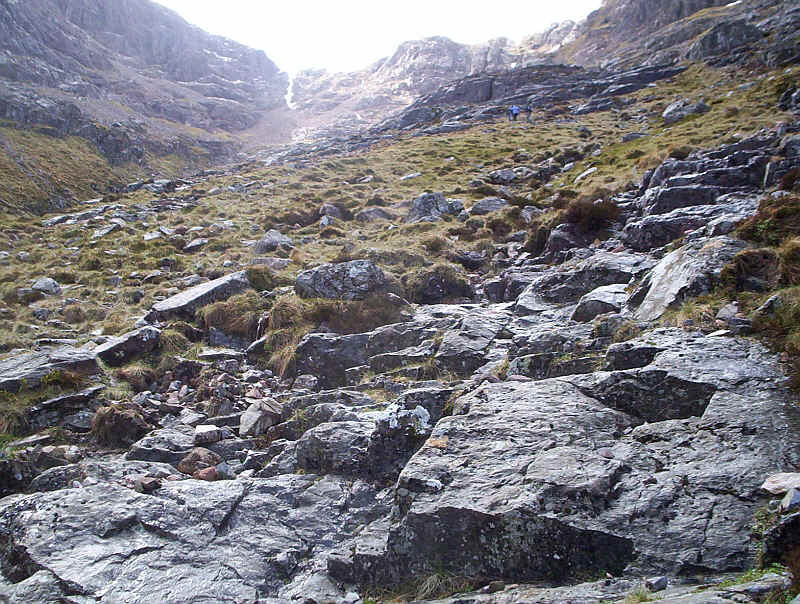 The third attempt was stopped by the amount of water coming down from the Coire na Tulaich. 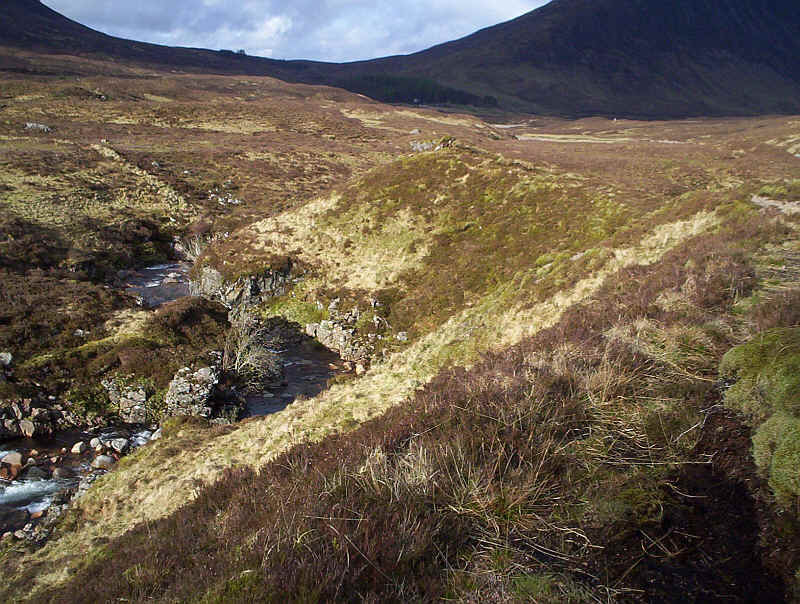 I started the walk from the Kingshouse Hotel which adds roughly an extra hour's walk in each direction to the normal time when starting from Altnafeadh. My walk was enlivened by being in the company of a young man doing the End to End walk from Land's End to John o'Groats and some Americans who found it hard to believe that it snows in Scotland in May!! 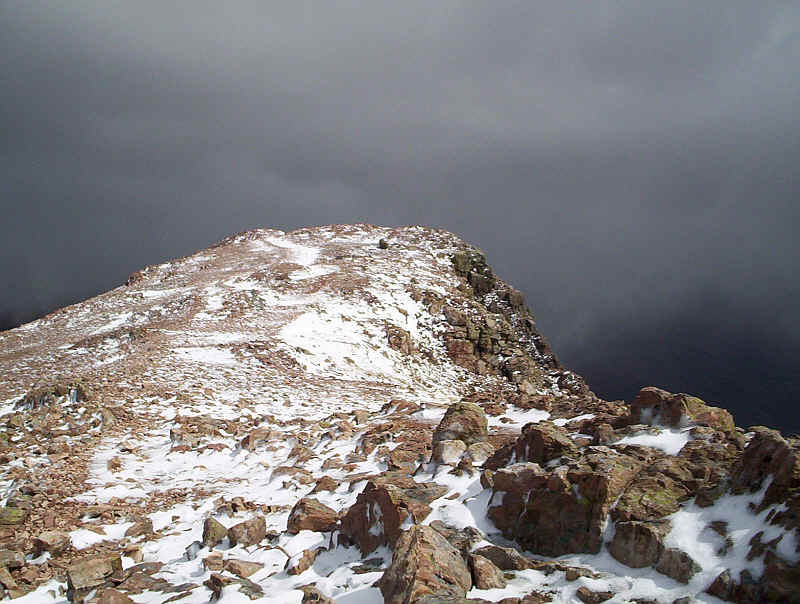 The day was one of sunshine, wind, occasional low cloud and snow showers. 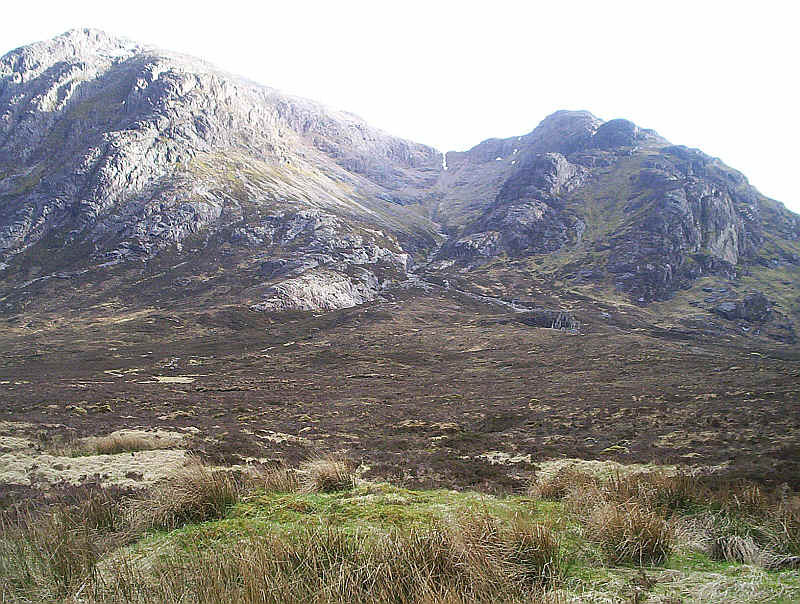 Below Buachaille Etive Mor's cliffs tower above the A82. 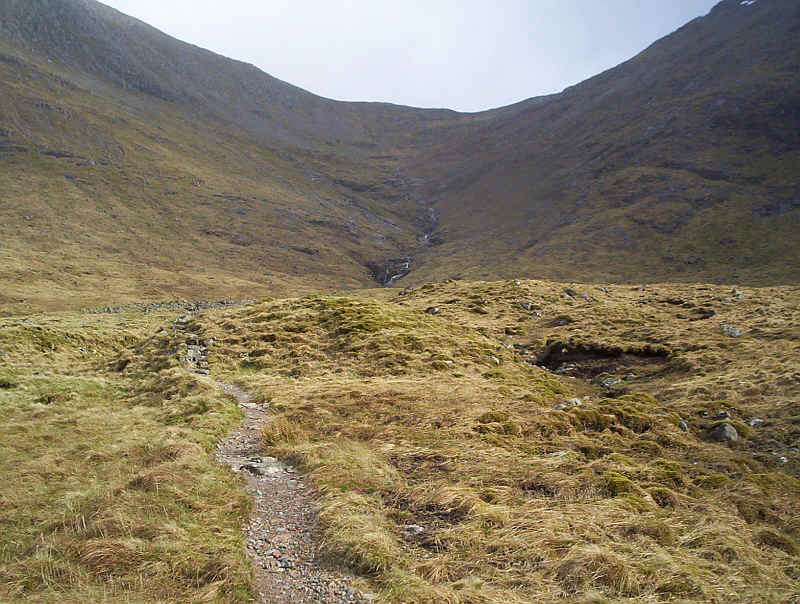 Needless to say, as I approached the path up a shower appeared and, seeing the new snow patches high up, I wondered what conditions would be like. 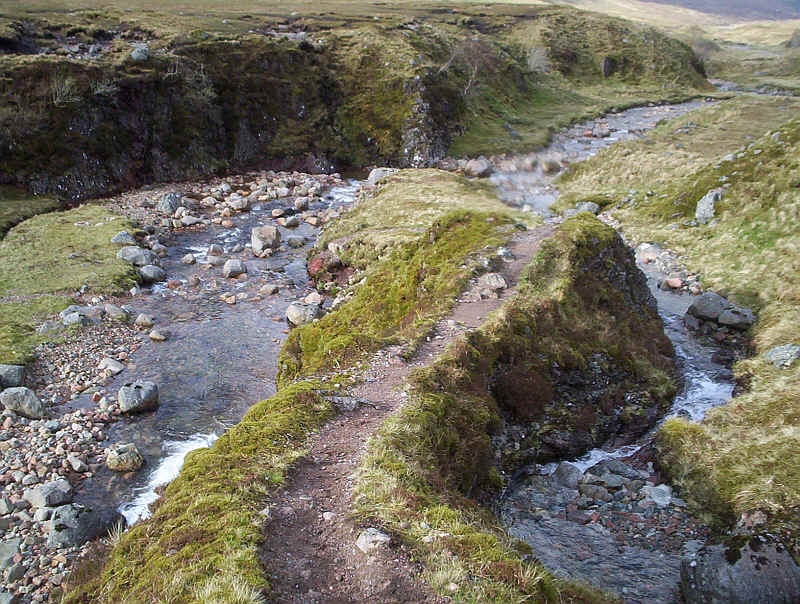 The path enters to corrie but first the stream has to be crossed. On this occasion there wasn't too much water and it was easy to cross dry-shod. Crossing to the right bank of the stream the track clambers over rocks as the ascent begins. 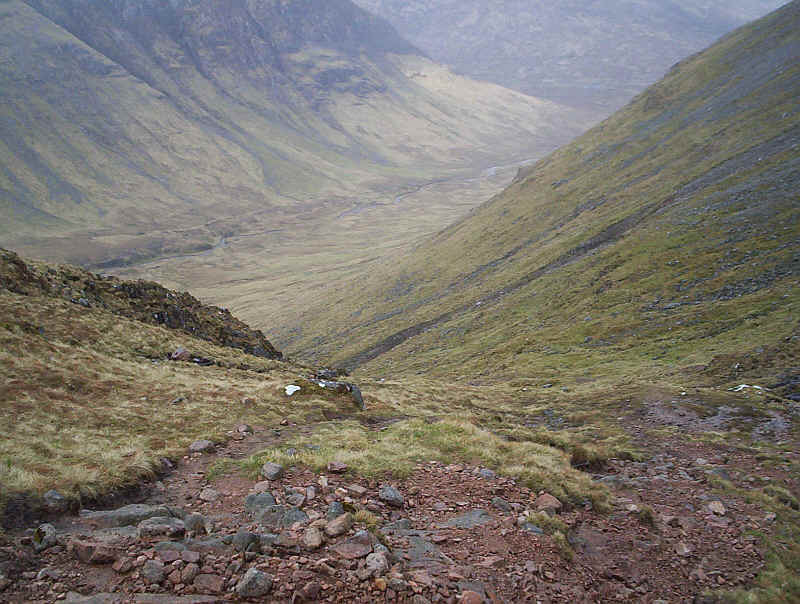 The further into the corrie that you climb the rockier and steeper it becomes. 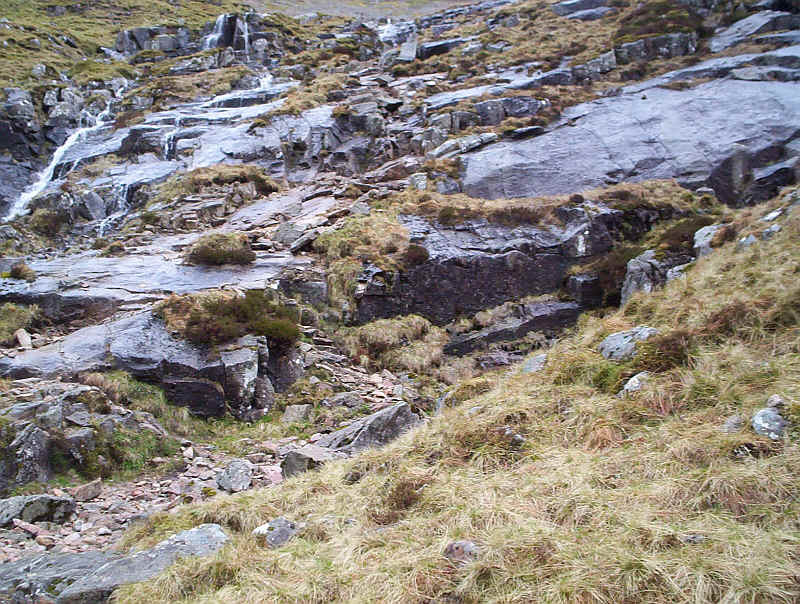 Most of the way up there is now a constructed path, although there are several awkward sections and it is by no means an easy route. Further up the path starts to zig zag to gain height. Looking back across to the Mamores and the Blackwater Reservoir the views open up. Nearing the top of the corrie the track crosses increasing amounts of scree before turning to the left beneath some rock buttresses and heading towards the skyline. 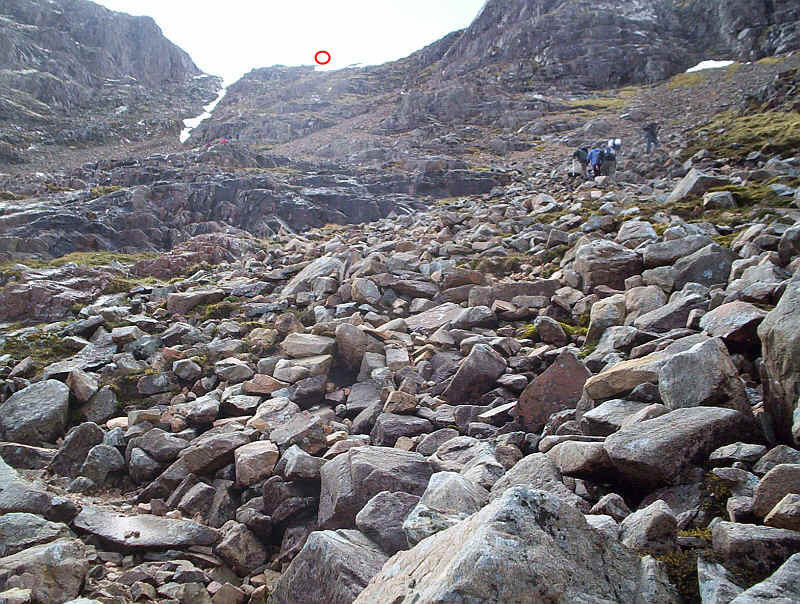 The track emerges on to the bealach above the corrie just to the right of the snow filled gully and underneath the red circle. 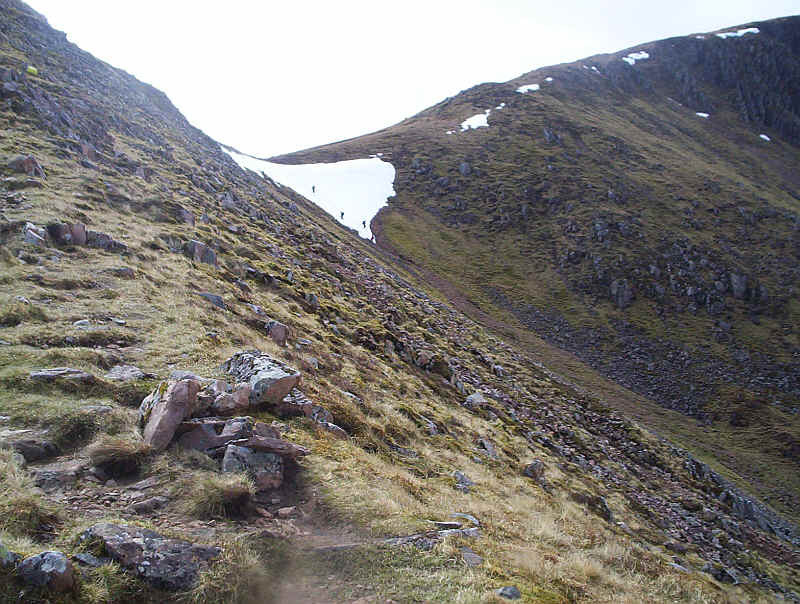 There was still a large patch of snow here and, whilst I saw some people climbing over it, I decided it was safer to bypass it and contoured across to the right of the snow on rocky ledges. 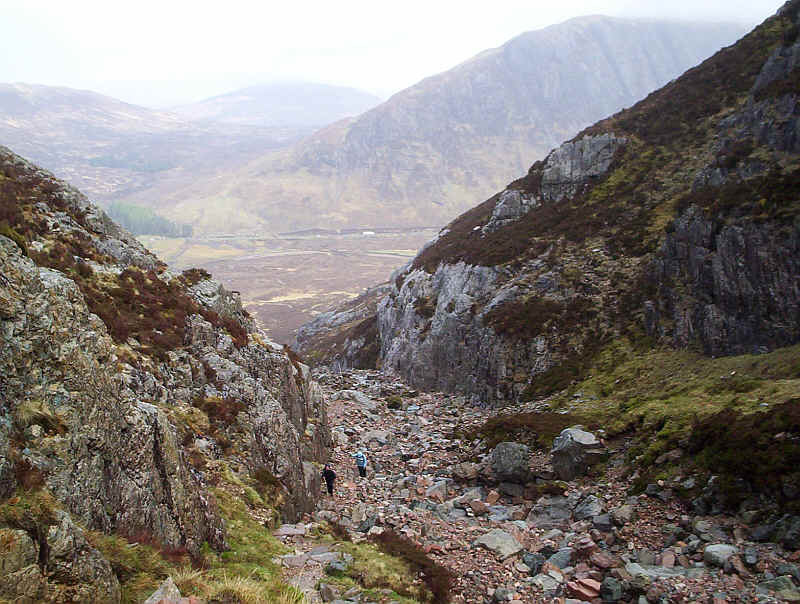 The sheer scale of the landscape is obvious from the size of the walkers traversing across the scree under the buttresses. 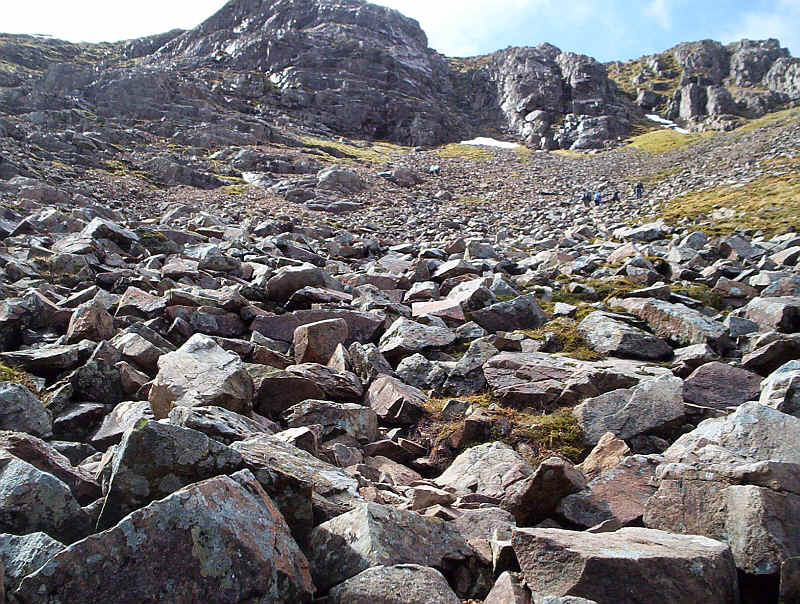 It was with some relief that I emerged on to the bealach at the foot of Stob Dearg. It's a demanding climb and I overheard two people who'd almost reach the top saying, "This isn't hill-walking, it's mountaineering." 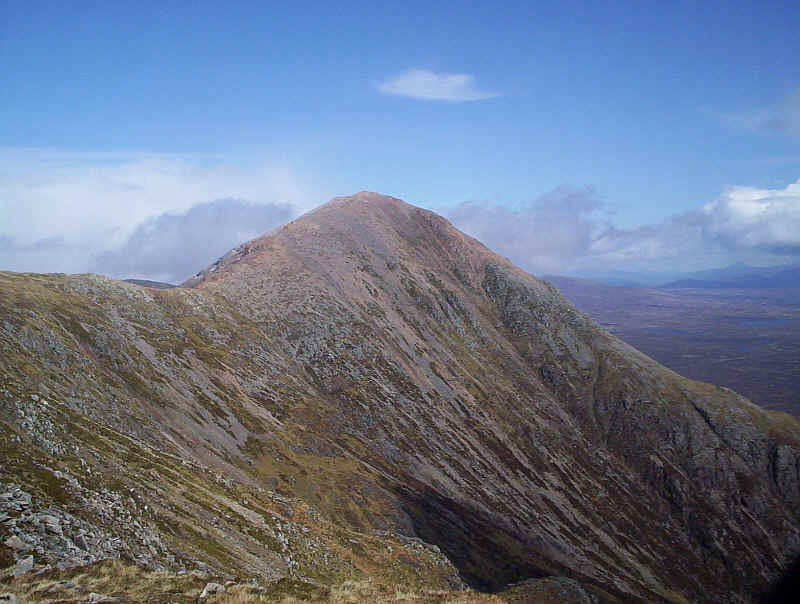 By now the summit was shining and my spirits soared as Stob Dearg was to be my fiftieth Munro ascent. From the bealach looking the other way the rest of the day's walk could be seen. 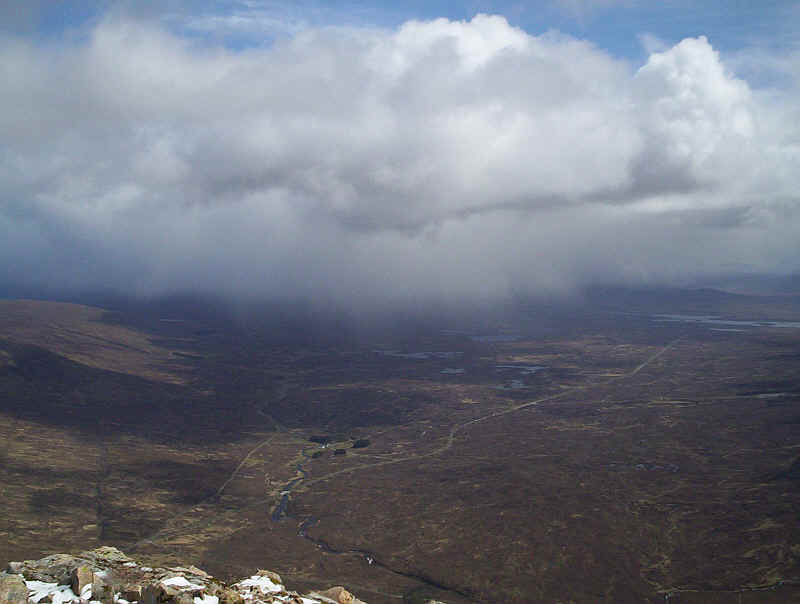 The summit of Stob Dearg had a slight covering of snow but, sadly, the view over Rannoch Moor was obscured by cloud. 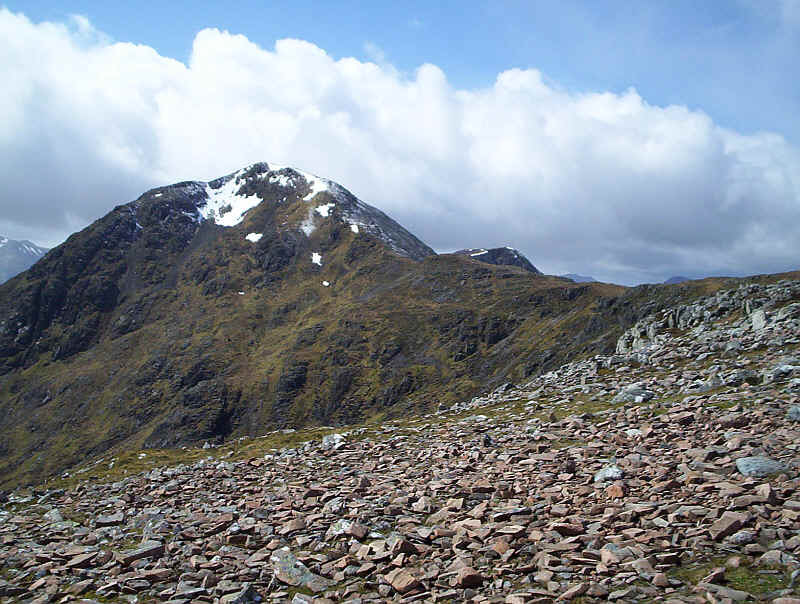 The summit cairn looking across Glen Etive towards Meall a' Bhuiridh and Creise. Below is a panorama looking westwards. 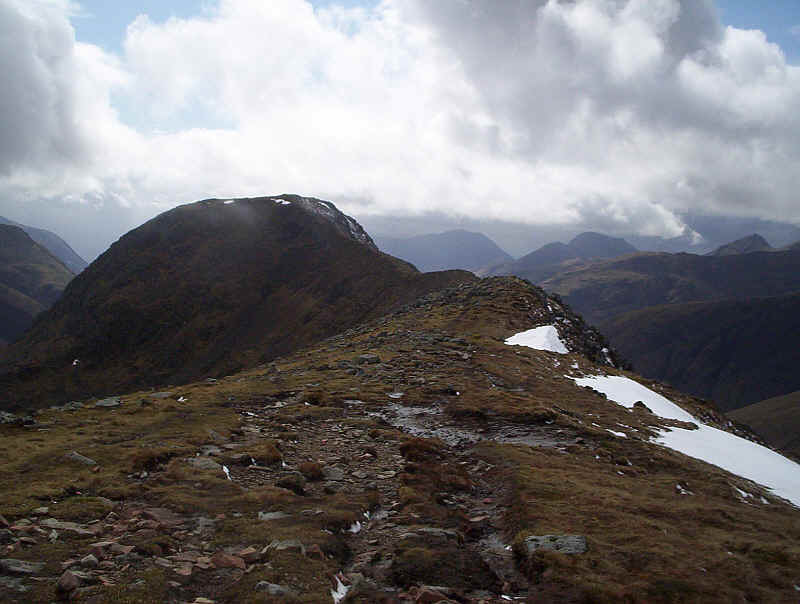 The snow covered hill in the centre distance is Bidean nam Bian whilst Glen Coe is to the right. Click on the photo for a larger image. The mist has lifted slightly for this view of Rannoch Moor. 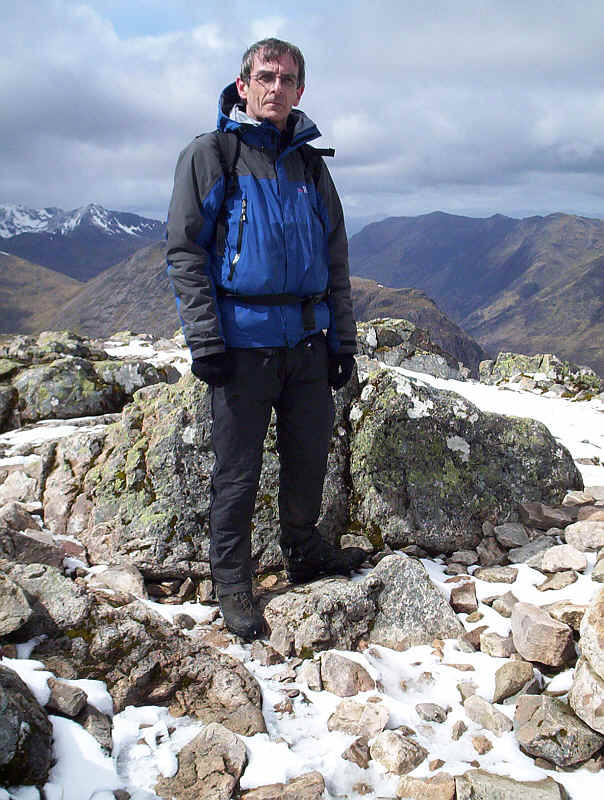 My fiftieth Munro is a good enough reason for a portrait! 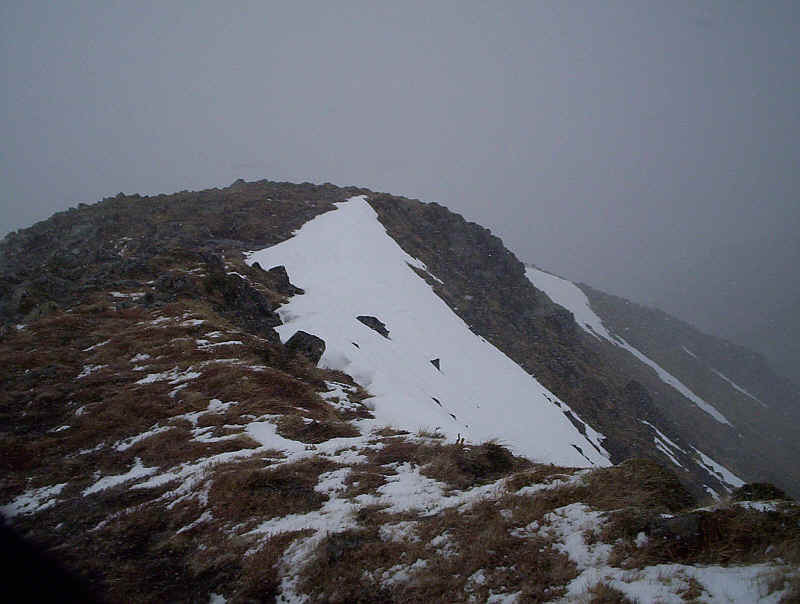 No sooner had I descended back to the bealach and begun the climb Stob na Doire than the snow started again reducing visibility considerably. 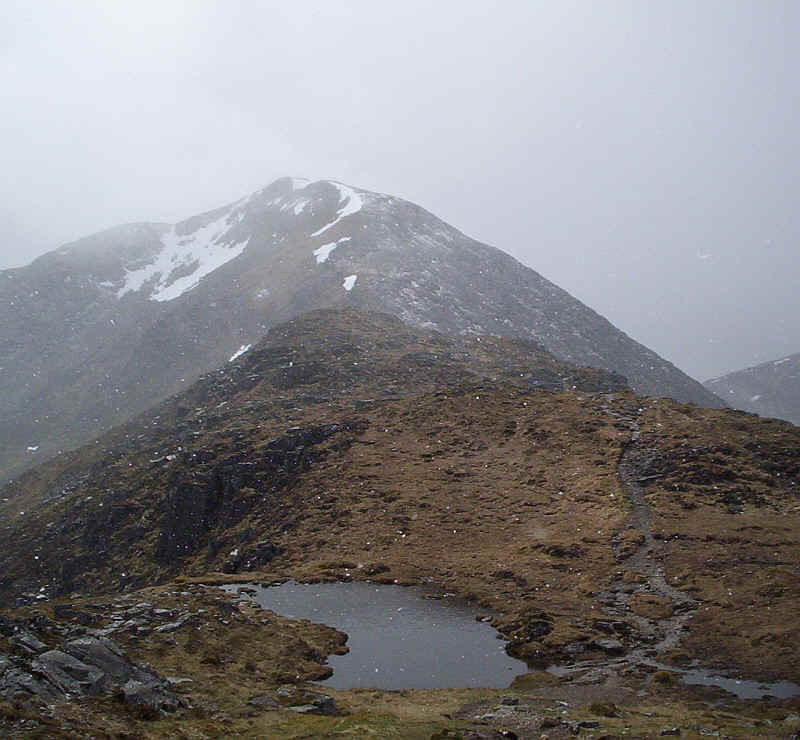 The photo below shows one of the lochans near the spot height of 902m. 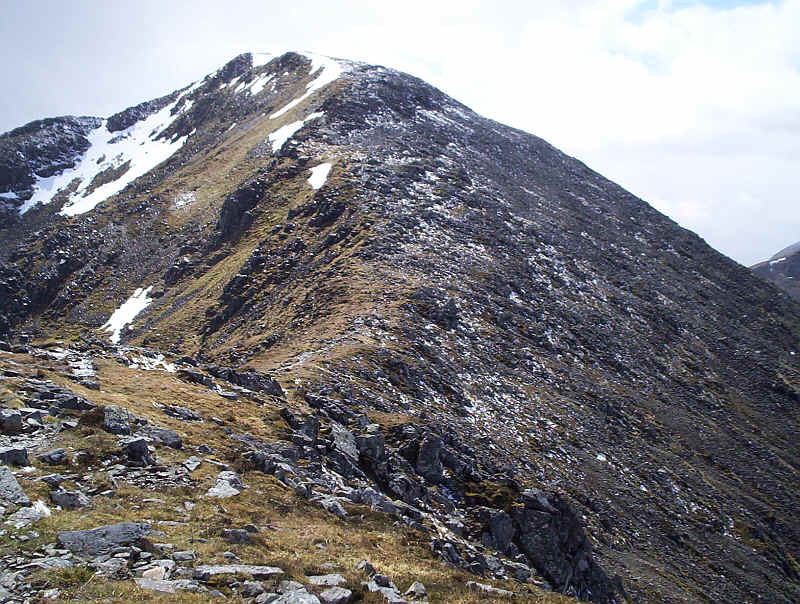 .......whilst beyond the next peak of Stob Coire Altrium can be seen. 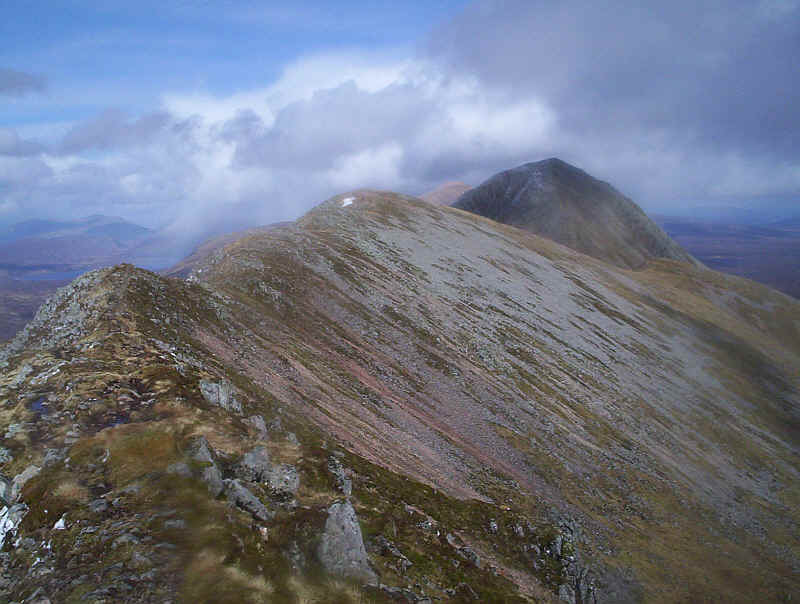 Visibility has really improved and in the photo below I'm looking back at Stob Dearg. It might look warm but the winter gloves were still on. As so often happens the mist came down again, and just at the wrong moment. 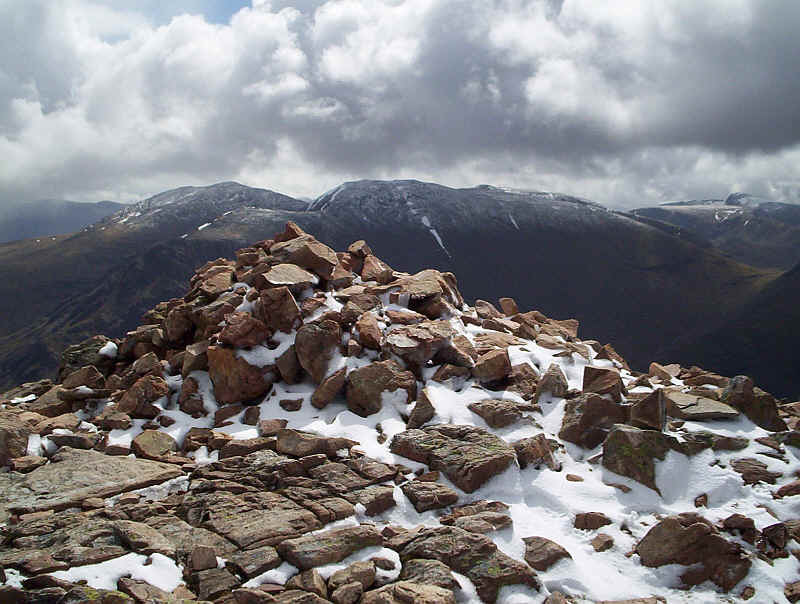 The view from the summit of Stob na Doire; at 1011m this peak is actually higher than Stob na Broige but isn't a Munro. Sometimes the Munro tables are a little puzzling! 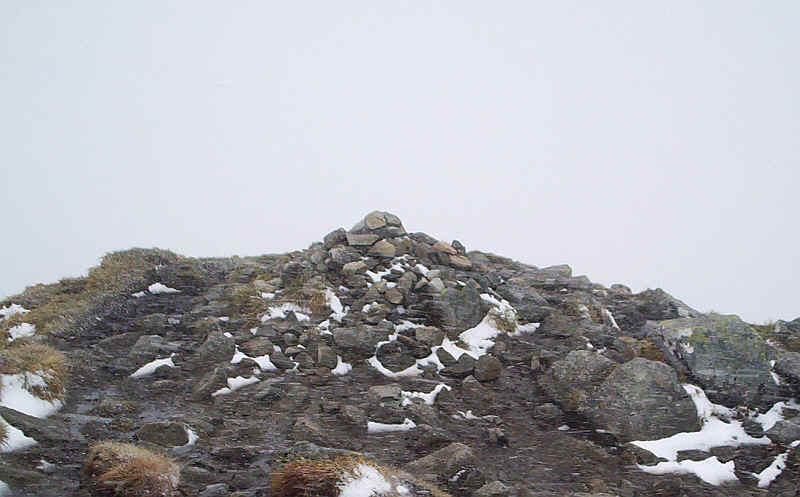 In the mist getting off the summit of Stob na Doire can be a little puzzling as there are several ridges all of which are narrow. However the one needed goes off down a rocky spur roughly SSW and has a clear track on it. Needless to say as soon as I'd dropped down a little the mist cleared and I was rewarded with this stunning view. 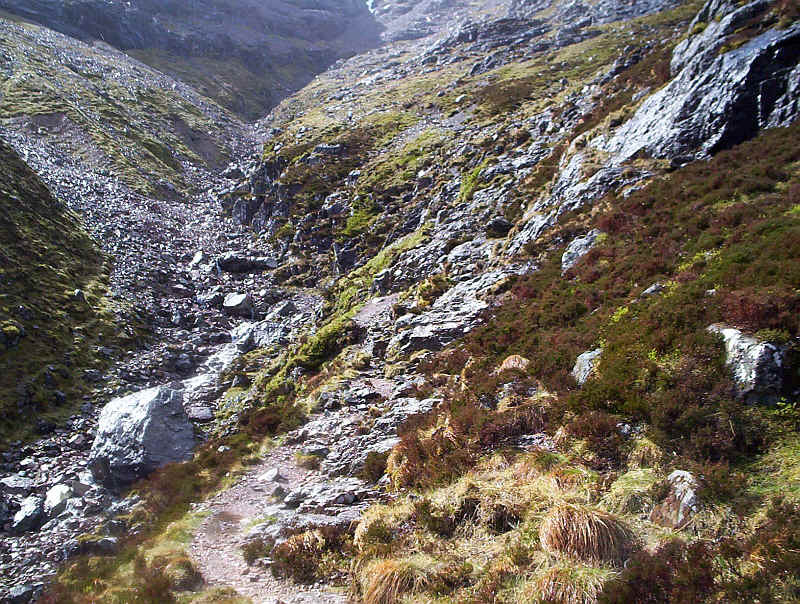 In the photo below the entire remainder of the walk can be seen. 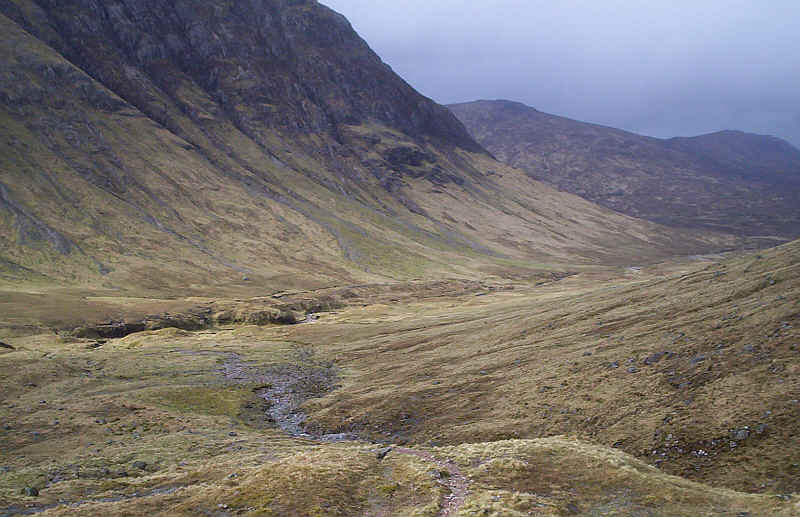 In the foreground is Coire Altruim with the path back to the valley starting at the low point of the bealach. 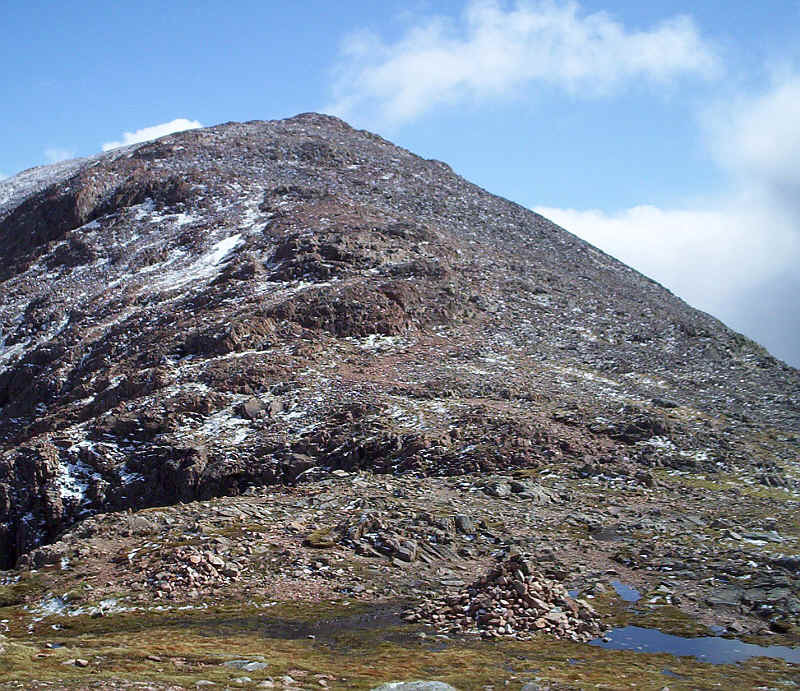 Beyond is the next summit of Stob Coire Altruim and beyond that the second munro of the day Stob na Broige. 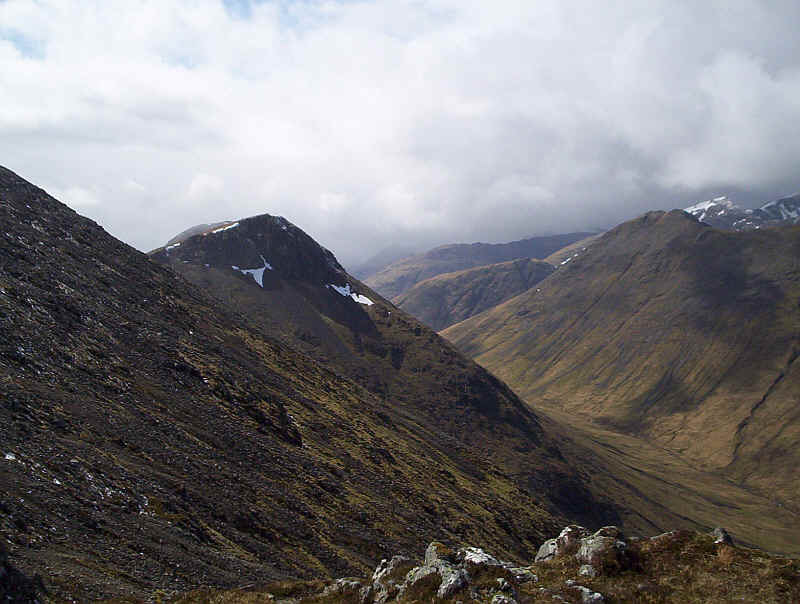 Across the valley is Buachaille Etive Beag. To my amazement four walkers were actually descending the snow on to the path to the valley.......... 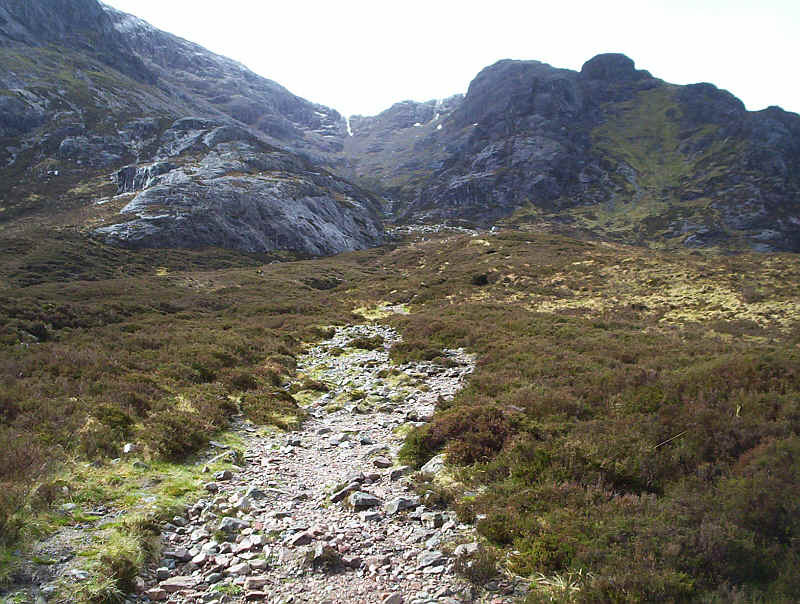 There are several tracks that lead down from the bealach all of which converge just below the snow. The ridge narrows noticeably and probably wouldn't be a particularly enjoyable experience in a gale. 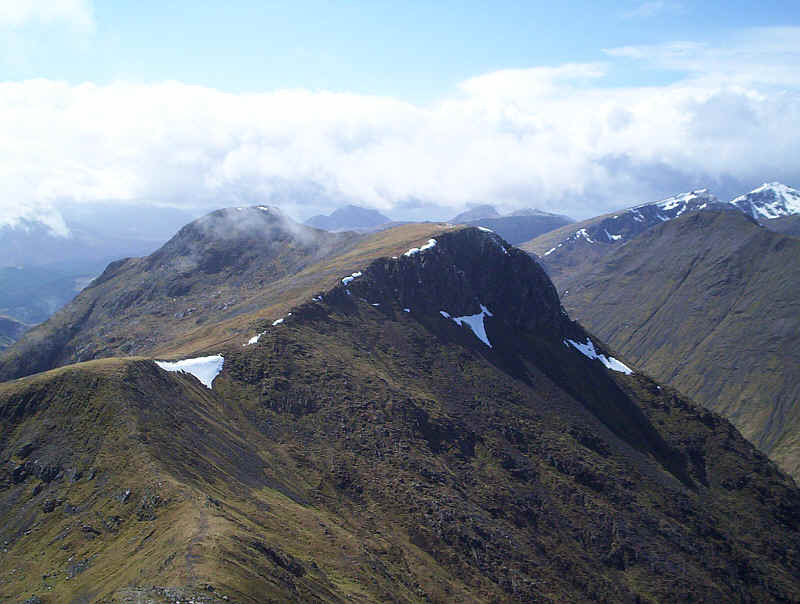 below I've pointed the camera back along the ridge with Stob na Doire prominent in the background. 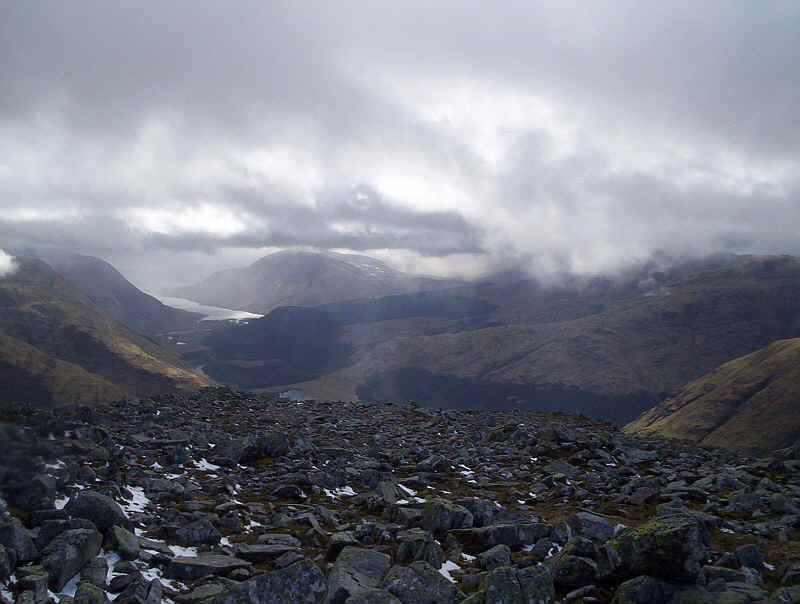 The final reward; the view down Glen Etive with the sun shining through the clouds onto the loch. Time to sit down and soak in the view before the long trek back. 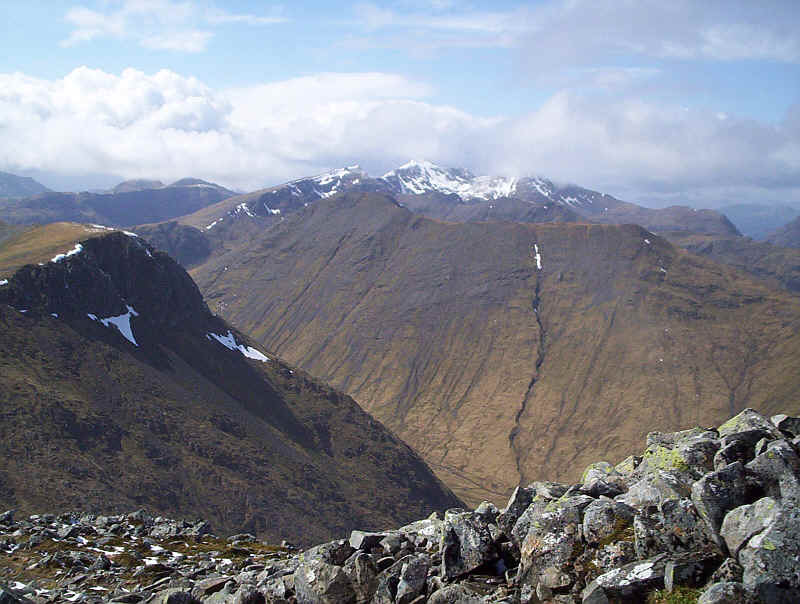 Across the valley is Buachaille Etive Beag with its twin peaks of Stob Dubh and Stob Coire Raineach. Click on the photo to see a larger image. Back at the bealach at Coire Altruim the path down in the Lairig Gartain heads steeply downhill from at least three starting points. ............whilst lower down the infamous slabs have to be crossed. Fortunately, the rocks were dry but it's certainly one of those places needing a lot of care not to mention sliding on your bottom and searching for decent foot rests. The photo shows just a small section of the slabs. 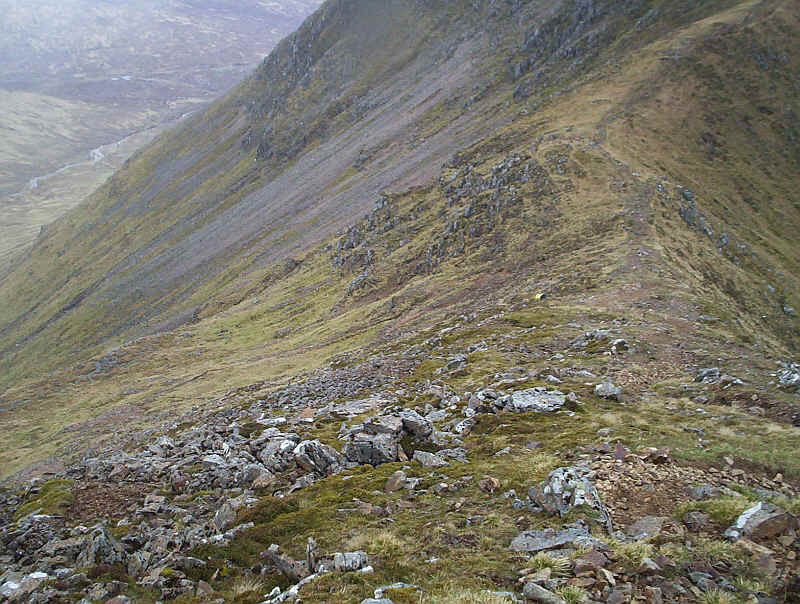 Looking back up into the corrie. 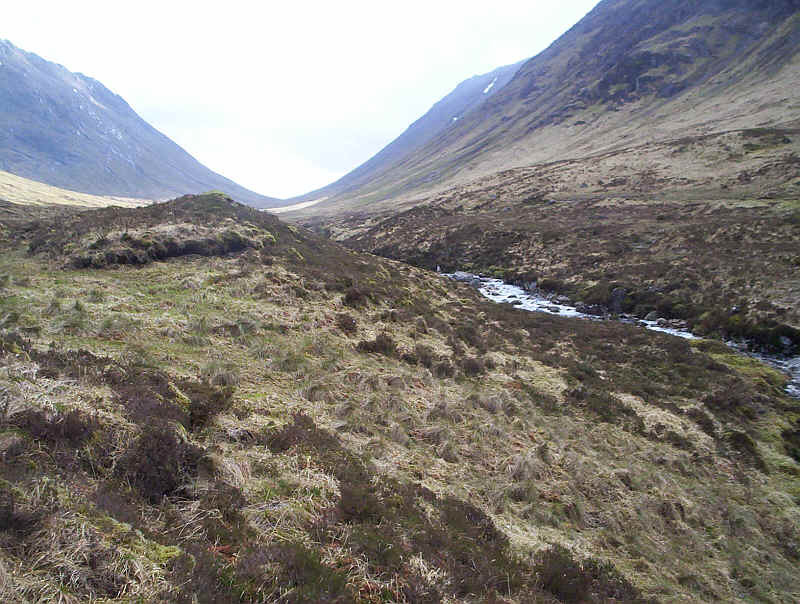 The path ends at this fascinating location on a peninsular between the stream from the corrie and the infant River Coupall. The river can be crossed here but I decided to walk along the right bank back to the footbridge over the river near Altnafeadh. 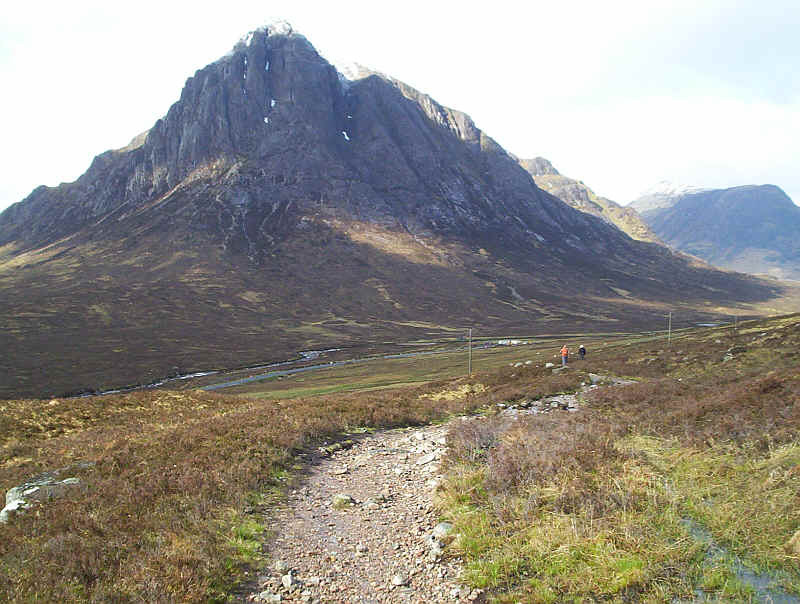 It saves having to cross the river, walk through a boggy section and then tramp along the A82. 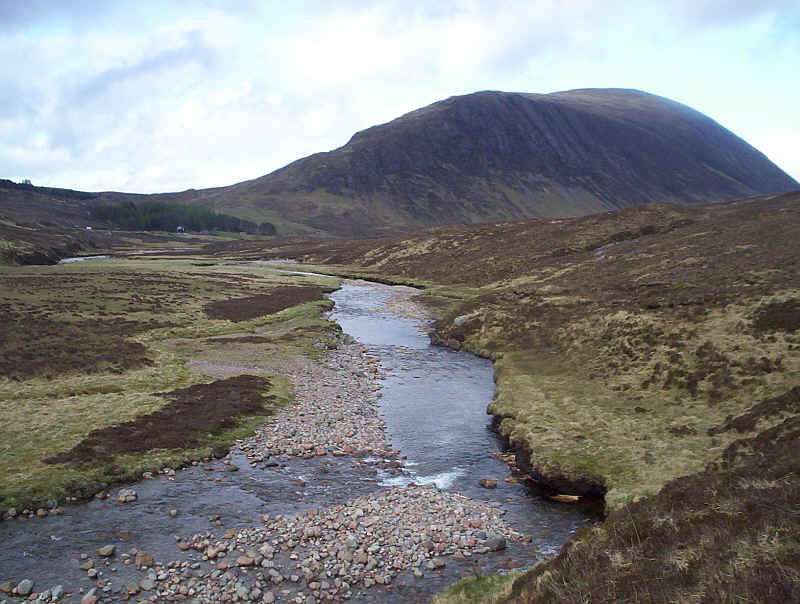 It's a pleasant walk back along the River Coupall. One of the interesting things is to see how the character of the river changes as it slowly matures. The next three photos illustrate this. Back at Altnafeadh the evening sun is lighting up Buachaille Etive Mor. 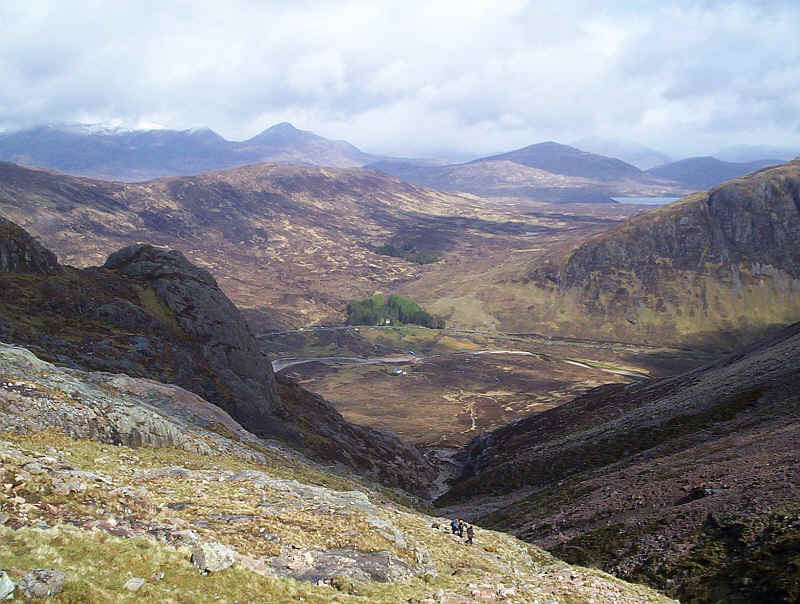 It was a superb walk, enhanced by the weather conditions but most certainly one of the most demanding walks I've done.